There is not much we can do to escape the heat but stay locked inside our house and blast the AC. On the rare (forced) occasion outside I make an immediate stop at the gas station (or Sonic) for the largest drink possible! Since lemonade is the ultimate thirst quenching, hydrating summer drink (besides of course water), I thought it would be fun to have a “Week of” themed all around lemonade! As I looked for lemonade recipes, I was surprised at how many recipes I came across that were for desserts and main dishes (not just beverages) that were inspired by lemonade or had lemonade in it. 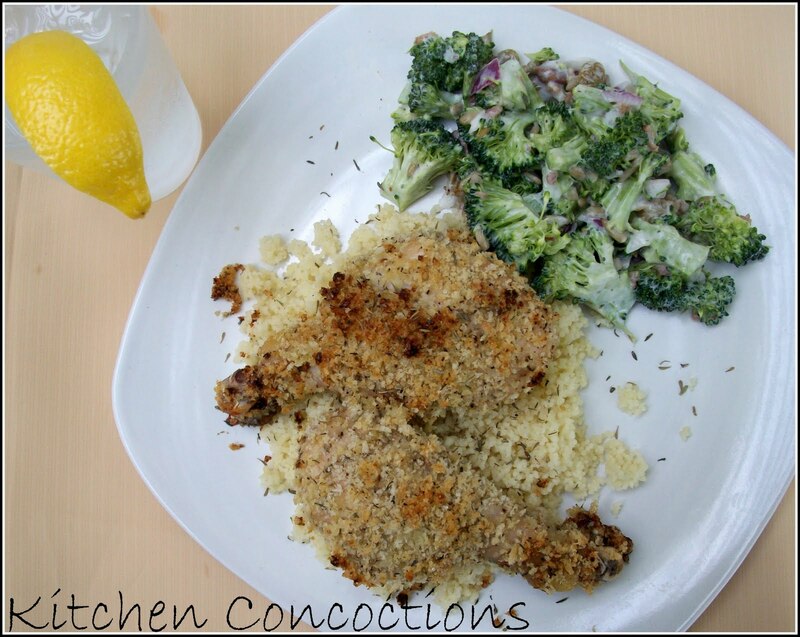 A prime example is today’s Crunchy Lemonade Chicken! 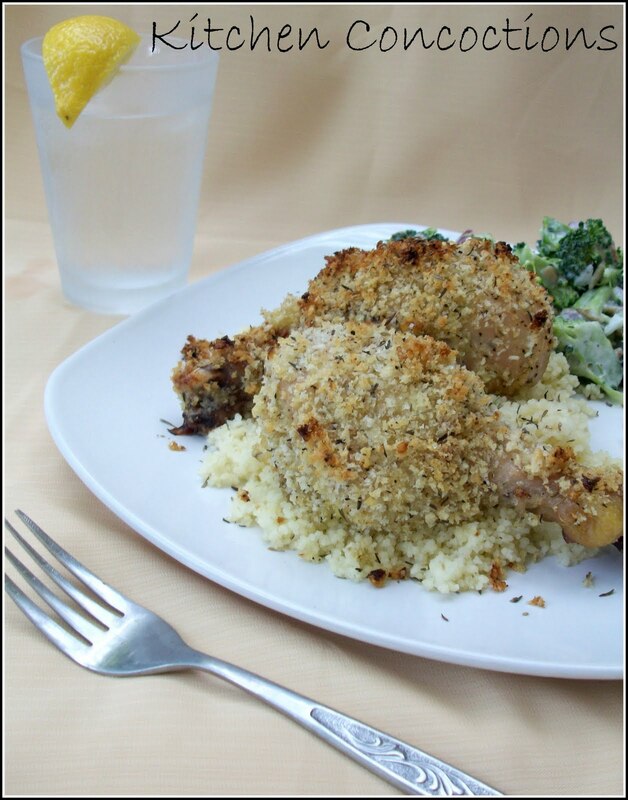 This chicken is light (despite the Panko coating) and has a very nice lemon flavor. And while this recipe requires marinate time and a longer cooking time but the actual work involved is minimal. Paired with a classic broccoli salad (recipe soon to come) and some couscous this meal can easily feed 5-6 for around $10 bucks (since chicken drumsticks are so cheap)! Mix 1 tablespoon lemon zest and the lemon juice in a large bowl. Add chicken broth and the sugar and whisk to dissolve, then whisk in the buttermilk. Reserve ¼ cup for later use. Pierce the drumsticks several times with a fork. Toss in the marinade, cover and refrigerate 4 hours, or overnight. Preheat the oven to 400 degrees F. Bring the chicken to room temperature. Put the panko, thyme, the remaining 1 tablespoon lemon zest, cayenne, salt, and lemon pepper seasoning in a large resealable plastic bag and shake to mix. Put the mayonnaise and reserved ¼ cup marinate in a bowl. Spray oven proof pan with cooking spray. Remove the drumsticks from the marinade, dip in the mayonnaise, then drop into the panko bag and shake to coat; transfer to baking pan. Mist the chicken with cooking spray. Bake until golden, about 45-50 minutes.